Newlyweds Celestial and Roy are the embodiment of both the American Dream and the New South. He is a young executive and she is an artist on the brink of an exciting career. But as they settle into the routine of their life together, they are ripped apart by circumstances neither could have imagined. Roy is arrested and sentenced to twelve years for a crime Celestial knows he didn’t commit. Though fiercely independent, Celestial finds herself bereft and unmoored. As their time apart passes, Celestial is unable to hold on to the love that has been her center. After five years, Roy’s conviction is suddenly overturned, and he returns to Atlanta ready to resume their life together. There’s a lot to unpack in this story, which is fictional but undoubtedly all too real for many families. It’s a love story at its core, but through the lens of a tragically common situation black Americans face today. I’m not surprised Oprah (and probably many others) picked this for book club—it makes for excellent discussion. How can black Americans achieve the American dream when they have to be twice as good and work twice as hard for it, when their achievements don’t protect them at all from persecution and discrimination? What about loyalty, or conditional vs. unconditional love? How do partners handle life-altering, stressful, major life events in their marriage? Does absence truly make the heart grow fonder? And more, like dealing with the stigma families deal with when one of their own is or has been incarcerated, nature vs. nurture, fathers and sons, etc. I’m happy I listened on audio. The actors, Sean Crisden and Eisa Davis, did a fantastic job performing these characters and giving them depth, especially during the epistolary first half of the novel. Their delivery and emotion gave Roy and Celestial life; I felt almost like I was experiencing a play in person rather than listening to a book. That’s also a testament to Jones’s wonderful storytelling. My one tiny complaint is that the ending was just a touch too tidy for me, but it (along with the rest of the story) was completely believable. An American Marriage lived up to the hype for me. Life isn’t strictly black and white, people are complex and flawed and both good and bad. It’s a powerful story about love, being human, being black in America, familial relationships, friendships, and reacting/recovering after the universe unexpectedly slaps you in the face and upends your life. This entry was posted in books and tagged audiobook, contemporary literature, drama, family, fiction, friendship, love, marriage, prison, race, race issues, society by kristin @ my little heart melodies. Bookmark the permalink. I am so glad you enjoyed this. When you mentioned the hype, I was worried that you felt it was overhyped. I personally loved this one and think it will remain my favorite book of the year. It’s a little early for me to say whether it’ll be a favorite book of the year, but it ranks highly for sure! Wonderfully written review, I’m glad you enjoyed it. 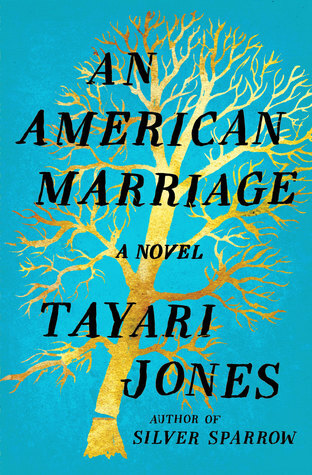 I recently started reading An American Marriage for my book club. I was actually hesitant about reading this because of all the hype with it being on the Oprah list and all that but so far so good. I think what I am liking most is the creative writing style, alternating between different narrators and even writing forms: epistolary and prose. I also love how this is not a typical love triangle story type of book but also explores highly relevant issues like racism and human rights.